There was the quiet sound of my paddle sliding into the water. There was the sound of rigging on nearby sailboats as it pinged against the mast while blowing in the breeze. There was the sound of waves crashing on the nearby beach. This was Catalina and this was different. I had to wonder, did people know about this? Twenty four hours before, I was heading through rush hour traffic from Orange county up into Los Angeles for an event in Hollywood. 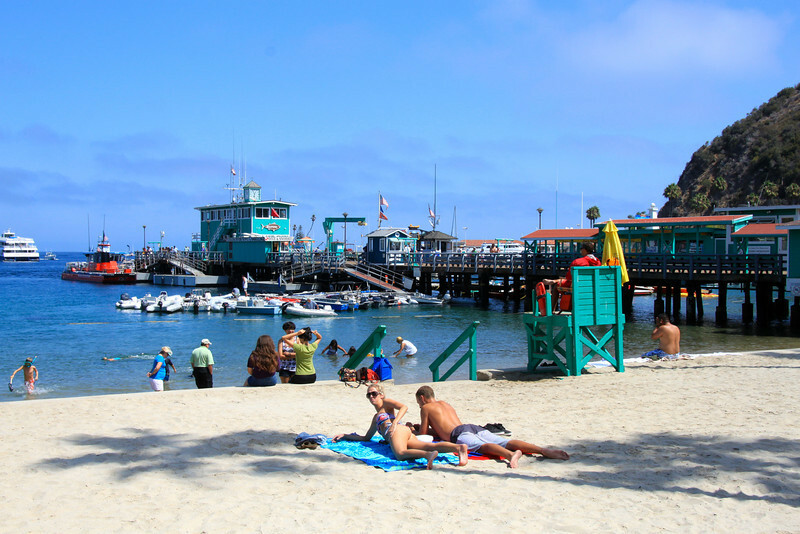 A Catalina Island day trip can make a nice break from the hectic pace of a trip to Los Angeles. In the time that it took to make that commute and with much less fuss I started the day by hopping a high speed ferry to Avalon on the island of Santa Catalina. 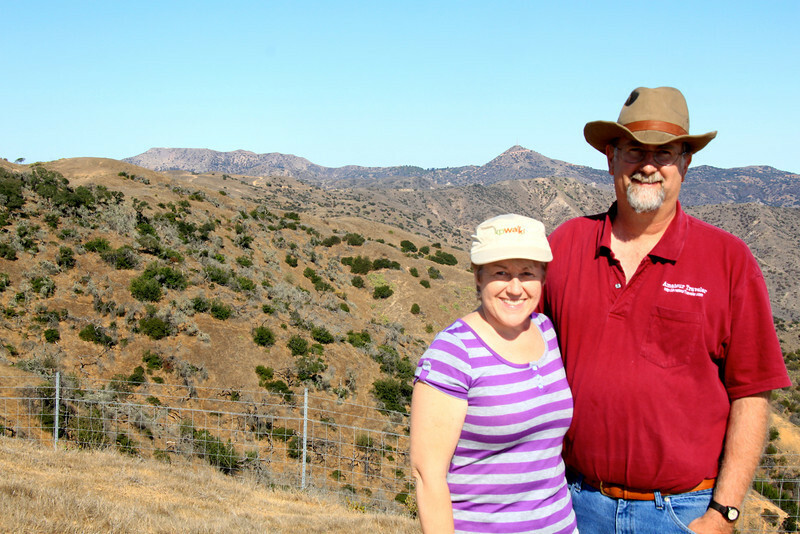 We had done an episode on Catalina island on Amateur Traveler, but I had never been to the island despite the many years I have lived in California. Only 26 miles from Newport Beach is the rugged island that enchanted Chewing Gum magnate William Wrigley Jr. who turned it into the playground not just for nearby Hollywood but for anyone who had ever purchased a 5 cent piece of gum from the Wrigleys. 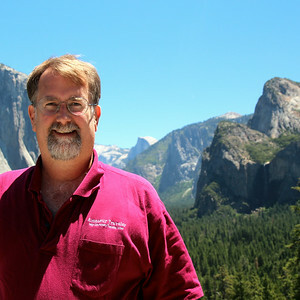 The Catalina Island Chamber of Commerce was kind enough to host me for this visit. They also arranged for my wife Joan and I to sample 4 of the island’s attractions. For a day trip you probably have time for two of these. The most easily recognized building on Catalina is the Casino which was built by William Wrigley Jr. It resides on the northern end of Avalon’s harbor. The Casino is 12 stories tall and was never used for gambling. Wrigley named the building from the Italian for a gathering place and only later did this name take on an association with gambling as the owners of Las Vegas hotels copied the name from Wrigley’s edifice. The Casino has a large theatre which was built not only with a large organ for silent films but with speakers for the new talking motion pictures. 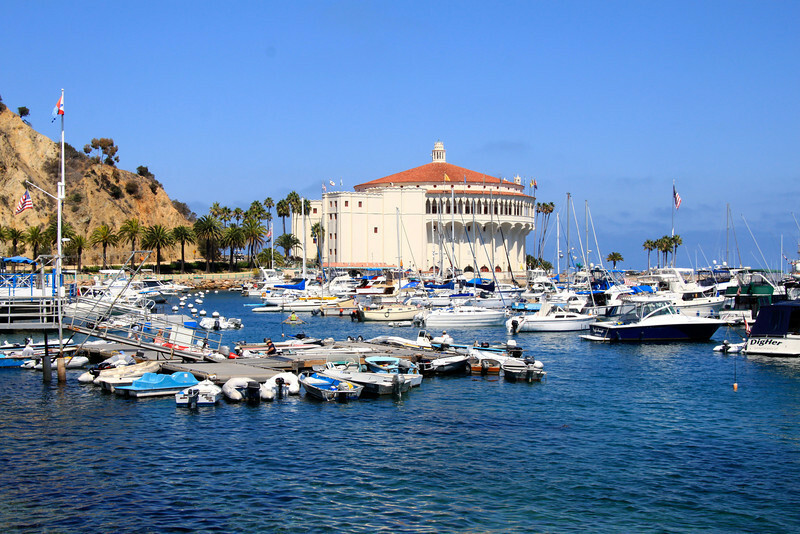 On the first floor of the Casino is the Catalina Island Museum which is a small (3,000 square foot) gem of a museum that describes the history of the island. The opening film which runs on a loop presents some of the highlights of island history in the form of a newsreel. 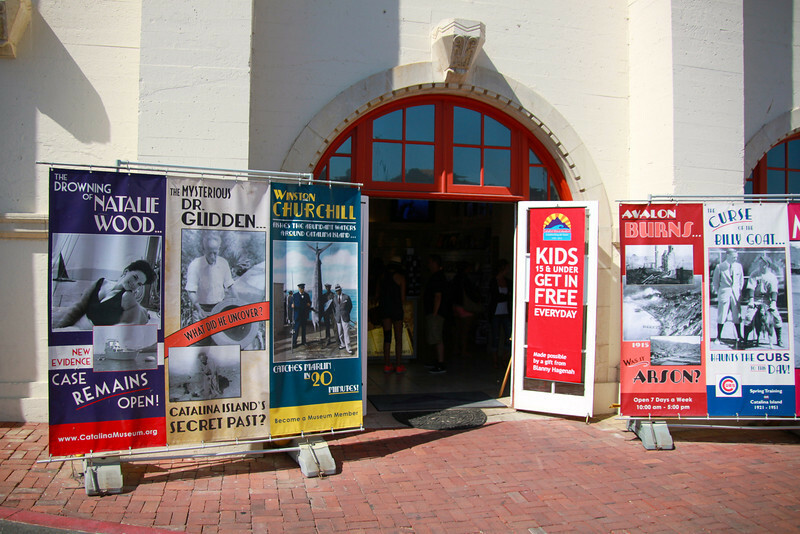 At the museum you will learn of the islands connections with the Wrigley’s, the Cubs who used it for Spring training, Winston Churchill, Zane Grey, and a virtual who’s who of movie stars from the 30s to the 50s. Natalie Wood died off the shore of Avalon. Charlie Chaplin started an airline of sea planes to ferry in the Hollywood elite. The island’s herd of bison dates to a rather unsuccessful attempt to film a Zane Grey western called “The Vanishing American”. The Museum also has a special exhibit as only 3% of the museum’s collection fits in the current space. A much larger museum is opening in town in 2015. The special exhibit when we visited was dedicated to the questionable work of local archeologist and part time huckster “Doctor” Glidden. Glidden excavated and displayed remains of the native Tongva tribe but wove unsubstantiated stories for the press of a race of blond blue giants that once lived on the island. Current price of admission for the museum is $10 for adults. After our tour of the museum we walked to the adjacent Descanso Beach where we hopped on sea kayaks and paddled North along the island’s leeward shore past frog rock. We opted for two single kayaks instead of a “divorce boat” as our guide called a double kayak. Teri, our guide from Descanso Beach Ocean Sports , pointed out the sites along the way such as Fox canyon (renamed from Rattlesnake Canyon which for some reason was scaring off the tourists). We saw orange Garibaldi, the state marine fish of California, bat rays, a couple of sea lions and a bait ball of fish in the clear waters below us. We paddled past the old seaplane dock which is now in Catalina’s only gated community (where Barbara Streisand was staying while we were on the island). We paddled past boaters jumping off frog rock, a floating jet ski dock and a church camp as we made our way 2 miles up the coast. After 4 miles round trip we were quite convinced of 2 things. 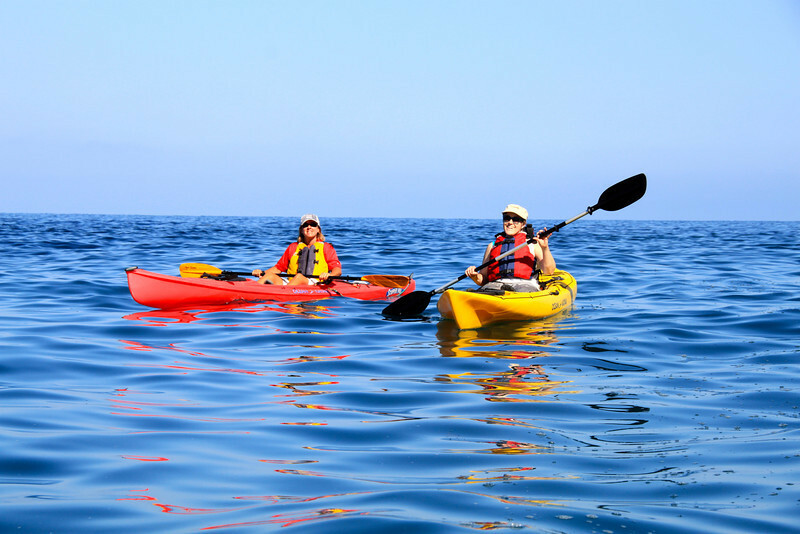 One, we needed to go sea kayaking again. Two, for today, we needed to stop kayaking immediately. The price of a 2 hour guided kayak trip was $48 a person or only $28 a person to rent the kayaks without a guide. 88% of the island is a private conservancy, the Catalina Island Conservancy, set up by the Wrigleys in the 1970s. They limited the size of Avalon to one square mile and then strove to eliminate some of the non-native species that were over grazing the island: wild boar, deer, goats. The goats and boar are mostly gone but seeing a 6 point buck walk into town is still not that unusual. 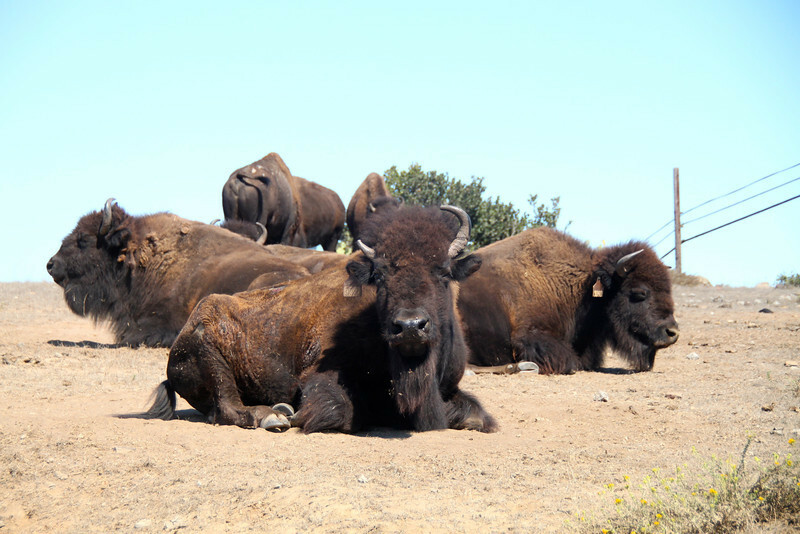 They strive to keep the herd of bison at 150 and developed a captive breeding program for the endemic species of fox when it was nearly wiped out by distemper that came through a few raccoons that made it to the island. We had sunshine but could look down on the fog which still clung to the island’s coast. 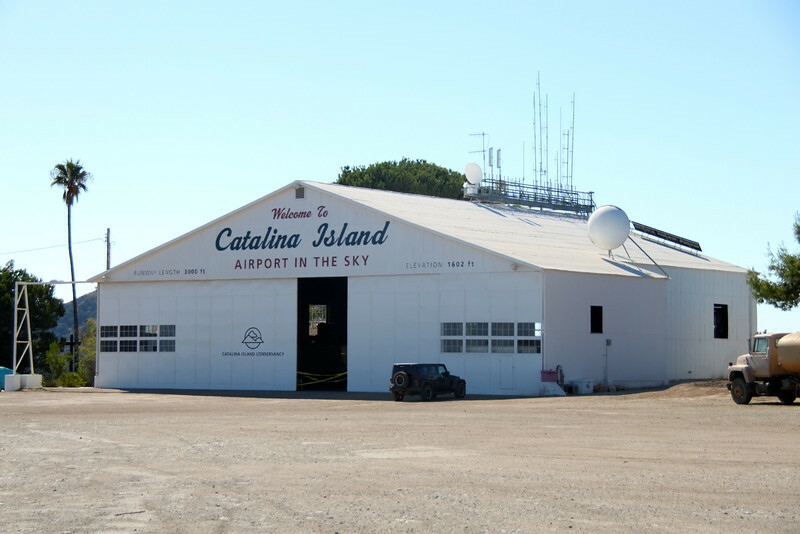 We went up to Catalina’s Airport in the Sky which is one of the most dangerous airports in the world because of the wind shear on both sides of the ridge it is built on. It does however boast a restaurant famous for its “buffalo” burgers and oatmeal cookies. It was too soon to try the burgers but we did sample the cookies so as not to be rude. On the other side of the hill from the airport we encountered a couple of dozen bison lounging next to the road. They rolled in the dirt to try and remove parasites and generally posed for our pictures. Andrew was careful not to disturb them as he had a bison charge a jeep and break the front roll bar just a week previous. A 13 year old who was probably throwing things at the bison was gored this Spring. 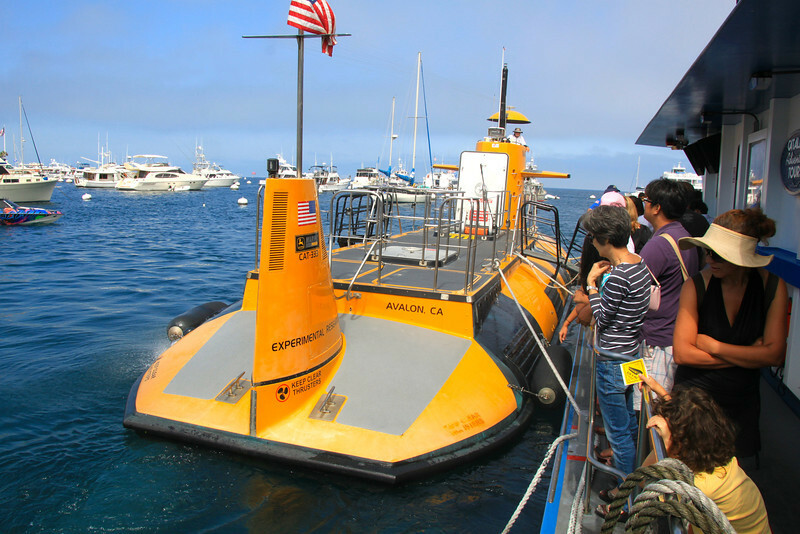 Our last activity was a voyage on the Nautilus Semi-Submersible from the central Green Pier in Avalon. The Nautilus looks a bit like Disneyland’s submarine ride and even has some of the same schtick that kids will enjoy. Be prepared to bring your credit card so you can purchase “fish food torpedoes” if you take the Nautilus with kids. You can fire fish food at two different feeding spots where the craft stops to see fish. You sit next to large windows but on the way out to the feeding spots I only saw a few fish and some kelp. But when we reached our destination the ship was surrounded by so many fish that at times it almost blocked out the light. The Nautilus also has outside lights so that it can run night tours. 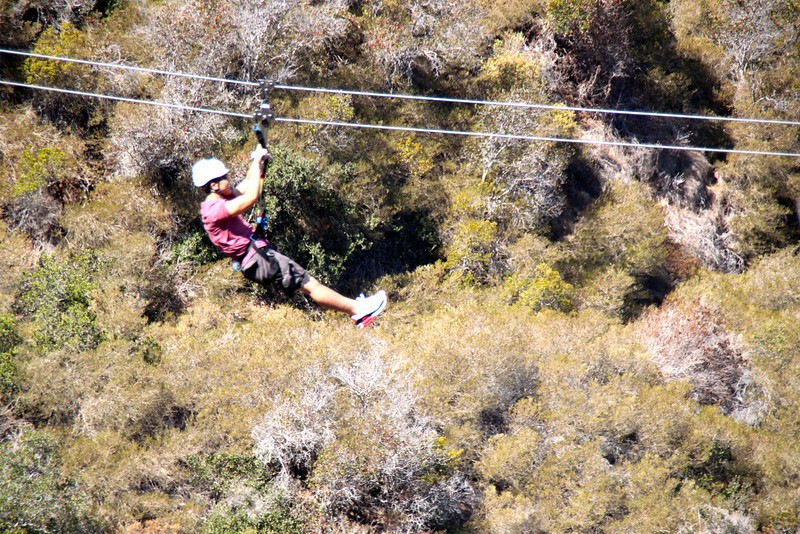 Like so many destinations these days, you can also go on a zipline tour in the hills above Avalon. The tour covers 5 different zip lines but also pauses in between to explain some of the wildlife, history and ecology. For a quieter trip you can just lie on the beach as do many who come to the island. We got to Catalina from Newport Beach via the Catalina Flyer. Boats also leave from Long Beach or you can fly via helicopter to the island. Be advised that if the seas get rough in the winter the ferries and barges that connect the island to the mainland stop running. If you want to come for longer there are definitely places to stay on the island. We stayed in a vacation rental provided by Catalina Island Vacation Rentals which was a lovely two bedroom duplex and is for sale if you are looking for a place on Catalina.